a technique of respiratory therapy, in either spontaneously breathing or mechanically ventilated patients, in which airway pressure is maintained above atmospheric pressure throughout the respiratory cycle by pressurization of the ventilatory circuit. A technique of respiratory therapy for either spontaneously breathing or mechanically ventilated patients in which airway pressure is maintained above atmospheric pressure by pressurization of the ventilatory circuit. a method of noninvasive or invasive ventilation assisted by a flow of air delivered at a constant pressure throughout the respiratory cycle. It is performed for patients who can initiate their own respirations but who are not able to maintain adequate arterial oxygen levels without assistance. 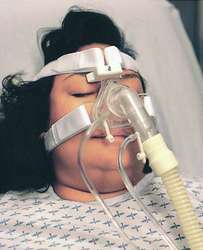 CPAP may be given through a ventilator and endotracheal tube, through a nasal cannula, or into a hood over the patient's head. Respiratory distress syndrome in the newborn and sleep apnea are often treated with CPAP. Also called constant positive airway pressure, continuous positive pressure breathing. Compare positive end-expiratory pressure. Critical care A type of artificial ventilation, in which the lung pressure is maintained above atmospheric pressure during the entire respiratory cycle. See PEEP. A technique of respiratory therapy, in either spontaneously breathing or mechanically ventilated patients, in which the mean airway pressure is maintained above atmospheric pressure throughout the respiratory cycle by pressurization of the ventilatory circuit. a method of medical gas administration in which gas is delivered to the patient at positive pressure in order to hold open alveoli that would normally close at the end of expiration and thereby increase oxygenation, preventing atelectasis, and reduce the work of breathing; abbreviated CPAP. It is used with patients who are breathing spontaneously. When the same principle is used in mechanical ventilation, it is called positive end-expiratory pressure. Experience of nasal continuous positive airway pressure (CPAP) by infant flow driver in a neonatal unit of a developing country. Long-term compliance with nasal continuous positive airway pressure therapy of obstructive leep apnea. Microvascular endothelial dysfunction in obstructive sleep apnea is caused by oxidative stress and improved by continuous positive airway pressure therapy. Obstructive sleep apnea syndrome affects left ventricular diastolic function: effects of nasal continuous positive airway pressure in men. An evaluation of the relative efficacy of an open airway, an oxygen reservoir and continuous positive airway pressure 5cm [H.
Symptoms of depression in individuals with obstructive sleep apnea may be amenable to treatment with continuous positive airway pressure. The system represents a novel treatment alternative to conventional continuous positive airway pressure (CPAP) for patients suffering from OSA. The Government of Saskatchewan, Ministry of Central Services, Procurement Services is conducting a tender for the supply of bi-level flow generators and continuous positive airway pressure (CPAP) flow generators. For a long time, continuous positive airway pressure (CPAP) has been the gold standard in the treatment of obstructive sleep apnea (OSA). Discovery Laboratories Inc (NASDAQ: DSCO), a biotechnology company focused on developing aerosolised KL4 surfactant therapies for respiratory diseases, has started its AEROSURF phase 2b clinical trial in premature infants 26 to 32 weeks gestational age receiving non-invasive nasal continuous positive airway pressure (nCPAP) for respiratory distress syndrome, it was reported yesterday. It appears that patients generally prefer these devices to continuous positive airway pressure (CPAP) therapy. In the study, 18 people with severe sleep apnea treated with continuous positive airway pressure (CPAP) played video games in which they had to navigate a computer-generated maze.